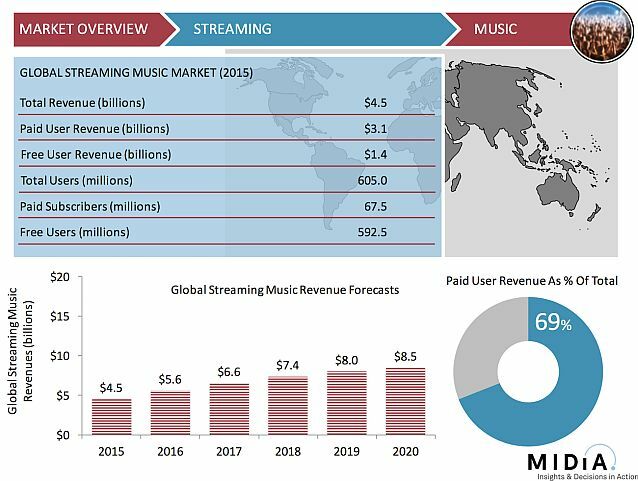 Midia Research released a new data report called State of the Streaming Nation, a comprehensive analysis of the audience and economics of streaming music globally. While available only to Midia Research subscribers, Managing Director Mark Mulligan shared the report with RAIN News. One key aspect of music streaming is its bifurcation of free listening and music subscriptions. Those two dimensions represent different business models — advertising for free non-interactive listening, and monthly membership for interactive services. As such, the first competes mainly with radio, and the second faces off against the music industry (with the music industry’s sometimes grudging cooperation). Total streaming revenue is $4.5-billion. Of that, 69% comes from paid use. But on the audience side, only 9% of 605-million total users around the world are paying for music subscriptions. So, while nearly 70 cents of every dollar comes from monthly membership payments, more than nine out of 10 users ignore music subscriptions and listen to their tunes free. What Should Music Access Cost? The report emphatically recommends exploring sub-$10 pricing to open a market of casual music buyers for whom $120/year is too great a commitment. At the same time, Midia praises upper-end products such as Tidal’s high-rez streaming at a premium price. Still, the report documents a near-doubling of streaming revenue growth between 2015 and 2020, to $8.5-billion. The optimism foresees continued audience migration to cloud-based access of music, and the monumental importance of that trend. U.S. readers should note that the Midia research is global, and all the more interesting for that. “The streaming market has a far higher degree of geographic diversity than the US dominated download market ever did,” the report notes. Audience numbers are charted for a diverse range of music services and Internet radio outlets around the world, putting a broader perspective on competitive positioning than U.S. observers tend to think. “Spotify and Pandora” is a popular phrase for succinctly referring to streaming music in the U.S. Midia Research not only (properly) separates those two business models, but inserts impressive audience metrics for several other brands. In the music subscription business, the leading duopoly is really Spotify and Apple Music. And on the free-listening side, Pandora is challenged (or exceeded in the audience-size department) by iHeartRadio, Radionomy, SoundCloud — and YouTube which is analyzed in more details than usual in streaming research papers. I agree that pricing factors into why some people prefer free tiers over subscription tiers. I’m on a monthly salary. My paycheck starts at $1000 each month. After bills, groceries, and other necessities, many times my checking account quickly goes down to $300 by the time pay day roles around again at the end of the month. I have to be rather frugal with my entertainment spending.